Eduardo frequently delivers conferences, training and keynote addresses on topics such as the sense of humour, positive emotions, creativity, motivation, optimism, communication, stress-reduction and positive psychology. And frankly, sometimes he just gets called in to wake up an audience after the lunch break. 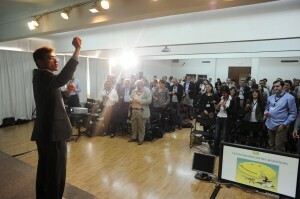 He feels equally at home in academic seminars, corporate kickoff sessions, public events, and press conferences, giving talks all around Europe and in the United States. As Eduardo explains in his books and articles, positive emotions promote learning –and he likes to set a good example. 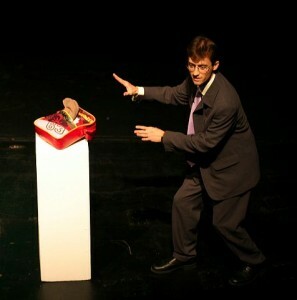 His dynamic, playful and humorous style of teaching gets the audience laughing and listening from the first minute. Eduardo is a world-class speaker who transmits not only facts but emotions, interacting with his audiences and inviting them to play, have fun and, on occasion, even sing, creating unforgettable experiences. In the corporate world, he has worked through his training consultancy Serious Fun, with companies such as IKEA, Oracle and General Motors. Currently he is a frequent speaker and facilitator at Hyper Island, according to Fastcompany one of the top 10 schools for the startup economy. 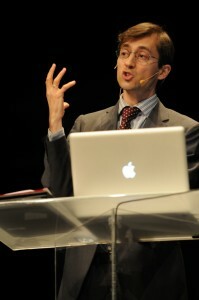 He has also delivered talks at venues such as the Royal Institution of Great Britain, TED talks, and the Winchester Festival of Art and Mind. For Eduardo, however, the top gig so far has to have been hosting the 57th Astronautical Congress,which brought to Valencia, Spain, the directors of NASA and the European Space Agency, engineers working on technology for future missions to Mars, and even real flesh and blood astronauts! He couldn’t resist the temptation to lead the 2.500 participants in a roaring countdown: ten… nine… eight… seven… six… five… four… three… two… one… BLASTOFF!! Would you like to hire Eduardo for a conference? Contact him directly.